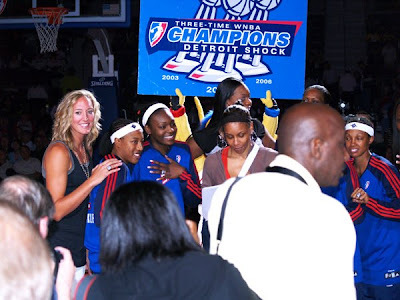 NEW YORK, July 22, 2009 – President Barack Obama will honor the 2008 WNBA Champion Detroit Shock for their accomplishments both on and off the court at a ceremony on South Portico of the White House on Monday, July 27, 2009. The ceremony will include a gift presentation from the Shock to the president. Prior to the ceremony, the WNBA and the Shock will join forces with United We Serve – a national effort launched by President Obama to engage more Americans in serving in their communities this summer – to host a special WNBA FIT Clinic at the Richard England Boys & Girls Club in Washington, D.C.. The entire team, along with WNBA Legend, Community Ambassador and fitness expert, Jennifer Azzi, will promote fitness, nutrition, and self-confidence to 80 boys and girls at the club through interactive stations and positive messaging. WNBA FIT is part of the league’s social responsibility initiative, WNBA Cares, which supports educational programming, promotes hands-on community service and inspires young people and women of all ages to learn about the importance of physical fitness and a healthy lifestyle.